- Select Function: SP-1, SP-1L (Label Touch Plate), or SP-1LH (Handicap Decal). - Delivery: The Securitron SP-1 is In Stock. Please allow 3-4 days' lead time on all other functions. Touch Sense Technology in a Wall-Mount Request to Exit Plate! The SP-1 uses touch sensing technology to create a push plate with no moving parts. For Indoor Use Only, the unit is oversized to cover a single gang cutout. 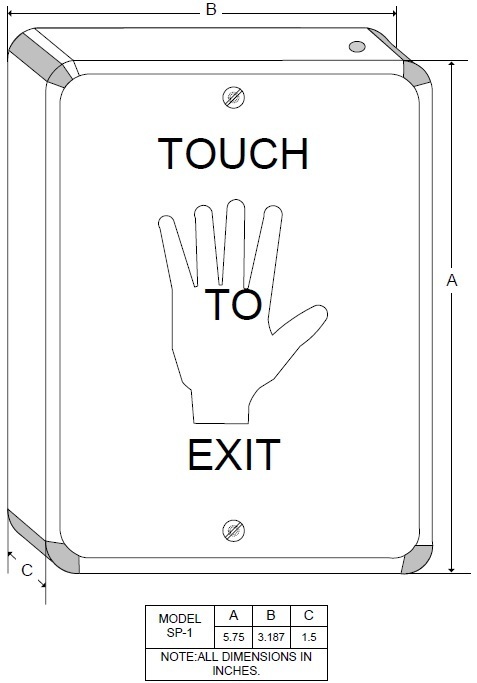 Ideal to assist with ADA compliance, the unit includes a three-part vinyl "Touch-to-Exit" decal. A red LED is incorporated into the backbox. - DPST 2 Amp rated relay. - Internal 0-25 second timer. Delivery: The Securitron SP-1 is in stock and available to ship. Please allow 3-4 business day lead time on other functions.